Thank You for Supporting the LGBTQ Center of Bay County! 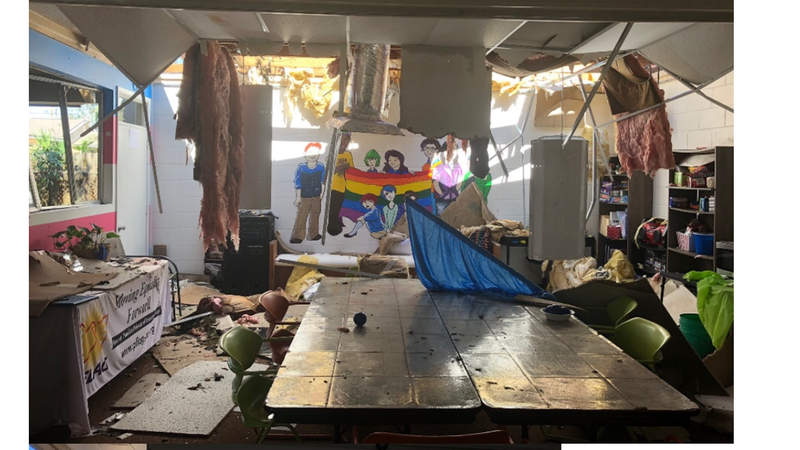 Hurricane Michael made landfall on October 10, 2018 as a devastating Category 5 hurricane — just one of four such U.S. storms on record and the strongest hurricane on record to make landfall on the Panhandle. The LGBTQ Center of Bay County was in its direct path. The Center was severely damaged and our buildings contents were destroyed. We are currently in the process of rebuilding and appreciate the support we have received from the greater Panama City community. Athough we are still rebuilding, our doors re-opened on April 1, 2019. With your support the Center will continue to enhance and empower Bay County's LGBTQ+ population through programs, services, and resources. In addition to our civil and human rights advocacy, the Center hosts PFLAG meetings, transgender support groups, weekly youth-peer-support group meetings, cultural proficiency training, suicide prevention programs and many other services. The Center offers the only dedicated program for youth ages 13-18 in the Panhandle of Florida. Then sign into your Amazon account with your email and password. Put LGBTQ Center of Bay County in the search field. NOTE: You must always access Amazon by entering “smile.amazon.com” in order to make a contribution. This will not increase the price of any purchases. The Center will get 0.5% of all purchases!! !